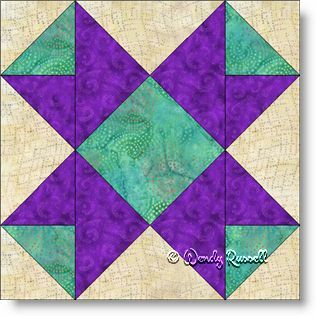 The Castles in Spain quilt block is an uneven nine patch design containing half square triangles and quarter square triangles in an unusual construction, but certainly not difficult. The end result is very striking. The sample quilts illustrated give two different looks. One sets the quilt blocks side by side and separates them with sashing. I chose to use two different colours for the sashing and repeated this in the borders, just to mix it up a little. The second quilt features the blocks set on point with extra blank blocks to feature quilted designs.